What are people saying about your brand on social media? 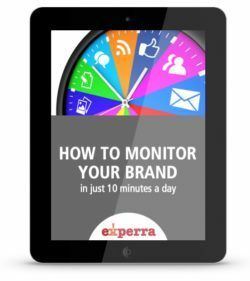 Monitoring your business brand’s presence on social media is incredibly important. The numbers prove you need to respond. Fast. You need to respond to people talking about your brand and understand how people view your company. Here’s why: Approximately 46% of online users count on social media when making a purchase decision (Source: Nielsen), 72% of people who complain on Twitter expect a response within an hour (Source: HubSpot). People are talking about your brand, your products or services, your competitors, your industry, and your employees—whether you like it or not. These conversations happen candidly in real life, which turns into threads and discussion groups on social media. Instead of ignoring these conversations, wouldn’t you want to jump in and have a say in where that conversation goes? If someone complains about your brand, wouldn’t you want to know why so you can improve in the future? Who should be monitoring social media? The activity of your different leads based on what product or service they’re interested in. The activity of thought leaders in your industry when they mention certain terms on Twitter. The conversation around the words and phrases that are core to your brand. Their open leads’ conversations, using the integration with contact lists. Their “closed lost” leads’ mentions of certain terms, using the integration with contact lists. Their “closed won” leads to check in with them after the sale, using the integration with contact lists. Questions or concerns people have about your products or services. Conversations that your customers and leads are having about your products or services. Conversations that your customers and leads are having about your products or services vs. competitors’ products or services. How you respond is critical. Show gratitude and respect. Never respond in an offensive or defensive way. Include facts instead of opinions and link to factual reference materials to support your case. Respond in a “brand voice” that reflects your company’s culture and values. Let the person know how you’re connected to the company. Let’s look at the best ways to monitor social media platforms. Your Facebook Business Page timeline is where your business fans, friends, customers, and critics can all interact directly with your company. They can post questions, comments, feedback, or fan mail. Fellow fans of your business may communicate with each other. Many individuals will interact with the content your company has posted itself. LinkedIn is arguably the most business-focused social media site out there. There are more than 562 million professionals around the world using LinkedIn as of September 2018. Its purpose is for networking, recruiting, social selling, content promoting, and generating thought leadership. What should you be monitoring on LinkedIn? Now that you’ve set up a consolidated platform for monitoring your brand’s social media presence, you can implement a new habit of opening your social networks and checking your emails first thing in the morning to find relevant information. Check for Twitter chatter about your company and its competitors. You can do this through TweetDeck, Hootsuite, and HubSpot’s Social Inbox, or through bookmarked or saved streams on twitter.com. Log onto Facebook to scan for comments, private messages, and reviews. Keep your company’s Facebook page bookmarked in your web browser and stay logged in to your account to save time. Read your LinkedIn group digest and scan your Company Page for new comments. Check your email for Google Alerts for brand mentions and industry-related content via Quora, blogs, or other sources and publications. By integrating this 10-minute plan into your schedule, you’ll have an excellent understanding of the social media conversations and content that is relevant to you, your brand, and your business online. Download our free ebook and discover how other brand marketers are spending time on social media, what you should be monitoring for and, most importantly, what tools will help you consolidate your social media information. Michael is the founder and Chief Branding Officer of Experra Branding Group, LLC, a brand consultancy that works exclusively with printing, imaging, product identification, converting and substrate technology companies to deliver short-term results and long-term value. He’s a brand strategist, business consultant and creative director with a passion for helping his global enterprise clients leverage the power of branding to crystallize corporate positioning, launch differentiated products, improve business processes and increase sales. We believe your business begins and ends with your brand. In between are all of the touchpoints that make up your total brand experience. Your “why.” Your vision, mission and core values. Your brand culture—or how your people deliver on your brand promise every day. Your consistent brand face, brand voice, and brand story in every communication. And of course, your logo and tagline. You can trust us to get your brand right, then deliver the right branding program. © 2019. Experra Branding Group, LLC. All rights reserved.